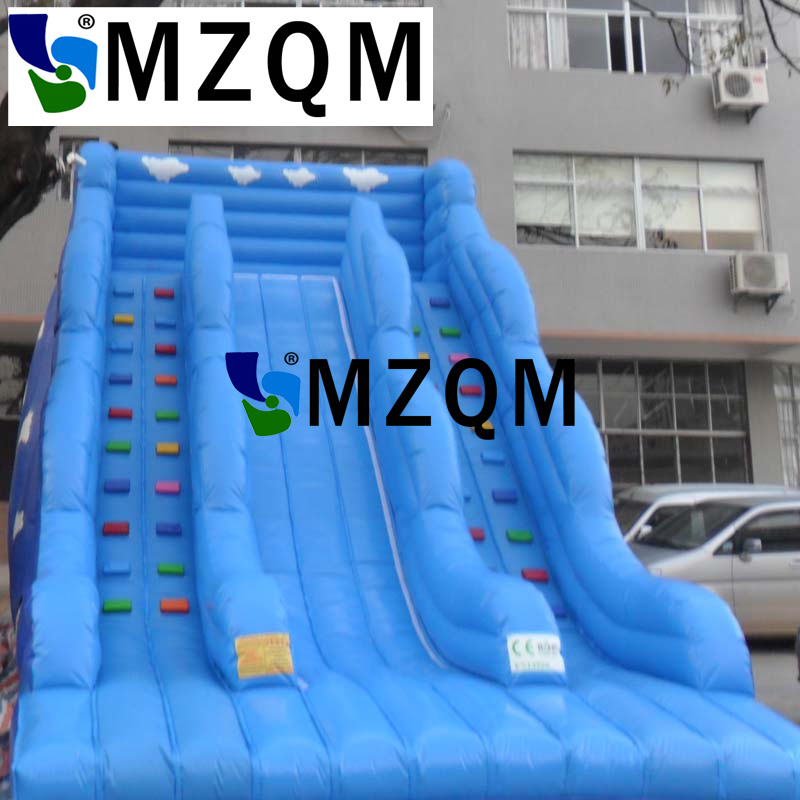 Our company is a professional manufacturer of inflatable products. We have been manufacturing high quality and safe inflatables since 2003. We offer a wide range of inflatables such as inflatable bouncers, slides,tents,promotion inflatables,water games,sports games and so on. We have exported our products to the worldwide countries such as Britain,America,Mexico,Australia,Canada,France,Saudi Arabia,Brazil,South Africa and so on. Just tell us your idea, and we\'ll work with you to bring it to life. If you can dream it,we can make it a reality. Choose us, it will be the best decision of you! Contact us right now! We focus on our design and production. Safety is our Mission. All the products are designed for your special requests.More than 2000 different designs are available for your choice. Sewing, All our inflatable products use Double, Quadruple,and in some areas 6-way box stitching to ensure our products will last. 1, Double-layer material sewn on stress areas like the bottom of the bounce house’s pillars, pop-ups, entrances, and high traffic floor seams to build the game stronger and safer. 2, Every bouncer will have 8 pieces of big D ring safety anchors at least to make the units more steady and the slide will have more. 3, Have reliable commercial grade zippers with hook&loop cover. All have integrated back flow flaps on deflation zippers to reduce air leak. Our top-ranking digital printing machine makes the printing artwork more clear and vivid. It last much longer time than normal one. Our excellent painter can draw different pictures as you want. Some price can not include the blower. When you place the order ,pls check what the "product description" part say.When you need the blower ,pls kindly contact us. Thanks. 1. What’s included in products? It includes inflatable product ,repair kits (the same colors material& glue),and blower or pump if the price included. 2. Your blowers and pumps meet CE/UL requirements? 3. Can we change the size and color based on the original? Yes, we can print your picture or logo on the inflatable products. Please provide higher resolution picture for our digital printing. confirmation. However, it can be +/- depending on the quantity,design and the dimensions. If you are very urgent for the products,please contact us more earlier. We try our best to catch the time for you. 7. How do I clean it? Just use soap , water or alcohol to clear it and keep it dry . Do not use any kind of solvents. 8. What kind of guarantee you give? Our inflatable products can be used for more than 3 years. If it is damaged, you can use the glue and material to repair it. Because it is too long distance to ship goods back, we will send a repair kit for every inflatable product. 1, We accept T/T, Western Union ,PAYPAL and Credit Card. The payment will be done through secure payment processor ESCROW. 1, We will ship your goods after you make the payment. All the products are made new and will be shipped out within 12 working days. 2, Your goods will be delivered by DHL,UPS,Fedex or TNT .Generally it will take about 7 to 10 business days to arrive at your city. 3, As the goods is heavy, to ship it by express is very high cost. But it is more convenient and quick.Some country is not in the free range. But we also provide big discounts off for the shipping cost. If your address is remote place according to the express company, some remote fee will be charged. Pls note it. Thanks. 4, If you want us to ship the goods to you by sea, we also can arrange it for you. The shipping fee will be more favorable. But it will need much more time. Pls contact us for further details. 5,Import duties, taxes and charges are not included in the item price or shipping charges. These charges are normally collected by shipping company /courier or when you pick up the goods. Any import charges or fees are the buyer’s responsibility.Pls note it. Thanks. If you are interested in our products,pls do not hesitate to contact us. You can leave a message about your questions and your email address, we will contact with you in 24 hours.All your enquiries are welcomed. before you leave negative feedback.We can work together to solve any dispute.